Most of the tools that we talk about each week are ones that I enjoy using, or the ones that I hear teachers talking about that they enjoy using in their classrooms. Beyond being practical, they provide added value to the task at hand. For me, this week’s tool is a superstar in this area: Dropbox. I love Dropbox! To begin, let’s watch this short video on Dropbox in Plain English. I use Dropbox a lot, both professionally and personally. If I’m going to a meeting and want to be able to quickly reference information from particular documents, I store those documents in my Dropbox and access them from my iPad. I also put recipes, shopping lists, etc. in my Dropbox so that I can access them from my phone. Your free Dropbox account comes with 2GB of storage space. For the average user, that is a LOT of space! It is enough space to provide some flexibility, too. For example, the media specialist at one of our elementary schools had a video that she needed to get to me. It was too large to send through email, and trying to find the necessary tools to burn a CD is a bit of a pain. The solution? Dropbox! She uploaded the video and I downloaded it – no problems! Since Dropbox allows for setting up shared folders, in which the owner can establish who has access, it provides teachers another option for students submitting papers or audio/video projects! To sign up for a Dropbox account, go here. 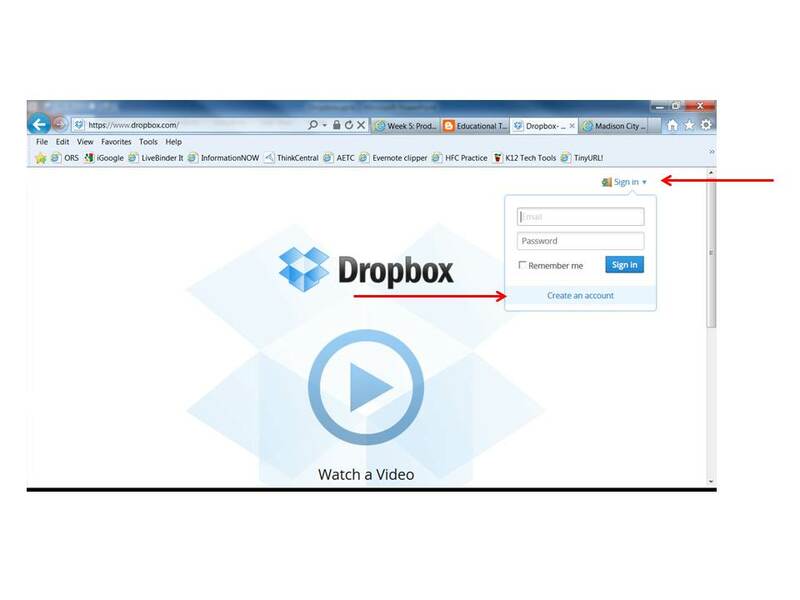 You can start exploring the online part of Dropbox, which can be accessed from any computer, even if the program is not installed on your computer. At the top, right hand corner of the page is the sign in link. 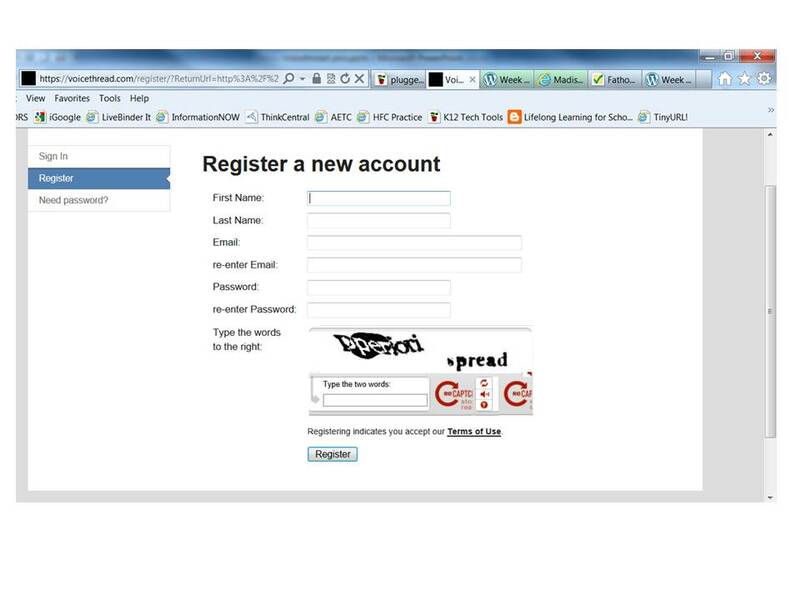 Click on it and you will see, at the bottom, the link that says Create an Account. Click on that. On the next page, fill in the required information and click on the Create Account button. That will get you in to the online version. You can also access my public Dropbox folder here. You will only be able to view the one document I have made available to you, but you will get a sense of how it works. Everyone has one public folder (that you can choose to use or not to use), but you also can have numerous private folders that you can choose to share with select people if you want. So, that is Dropbox! What do you think? Have you used it before? What are your thoughts? I can’t believe it’s Wednesday again already – where does the time go? Let me just state up front that this week’s post is MUCH shorter than normal – no cheering, please! I was at AETC last week; I am co-presenting at NATC this week; and I am leaving Friday for ISTE. Thank goodness for long, restful summer breaks, right?!? This week we’re going to look at Evernote. Evernote is a great free online tool that helps you keep track of notes as well as information that you find online. You can install it on any computer you use as well as your smart phones, iPads, etc. Here is a quick, one minute introduction to Evernote. Here is a short article that lists 7 reasons why you will love Evernote. This blog article lists 10 ways that students can use Evernote in school. And, finally, here is a resource site for using Evernote in education. Try Evernote out by signing up for a free account. 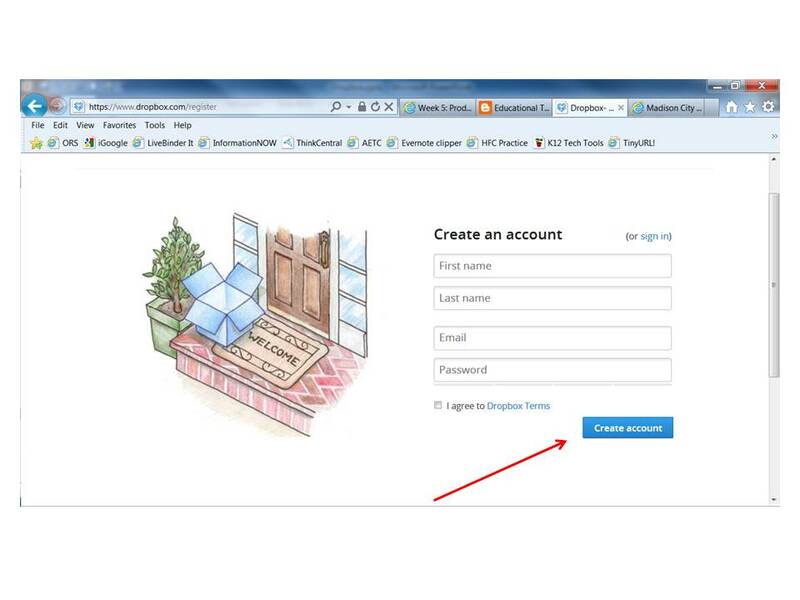 Click on the Create Account link at the top right hand of the page. On the next page, fill in the required information and click on the Register button. Play around with it and see what it can do. If you decide that you like it or want to explore more, download it to your computer(s) and/or smart devices and start syncing your notes! I know that a lot of students really love Evernote. Do your students use it, or do you use it? Is it new to you? What do you think about it? Watch this short video that describes Glogster. Now that we know what Glogster is, let’s look at some examples. We’ll start with some glogs from Ms. Lindsey’s class at WMES. This is a series of three short videos that are presented by her students, showing off their glogs! And a couple of lesson plans, too! To get started, register for a teacher account on Glogster. Teacher accounts are free. Fill in the required information and create your account – very easy! Then, click on the ‘Create New Glog’ button to get started. Play around, see what you can do and, if you feel like it, share your new glogs with the rest of us! What do you think about Glogster? Is it something that you think your students would enjoy using? Are you already using it in your classroom? Share your thoughts/comments/questions! Welcome to June! You may or may not have noticed, but everything we talked about in May was related to writing and sharing – resources and ways that you can share other resources with your students, encourage them to write, and allow them to collaborate. The same tools also allow you to share resources and collaborate professionally. Now that we have started a new month, we are going to switch gears a little and spend time talking about presentations. Presentations are a part of most classrooms, and we all know how most students present materials: PowerPoint, oral reports, and posters. Just in case you (or your students) are bored with the status quo, we’re going to investigate some different ways that students can give presentations in class. This week, we’re going to look at VoiceThread. What is VoiceThread? VoiceThread is a website that allows users to create digital slideshows of images and also record their voices over the images. In addition, users can share their slides and allow others to record comments, creating a thread. Here is a brief VoiceThread slideshow that talks about how VoiceThread works for education. Escape on the Underground Railroad – A 5th grade class demonstrates the integration of visuals, voice, and teacher annotation. 8th Grade Child Labor Investigation – An A/V lesson plan by a teacher explaining a cross-curricular approach to the industrial revolution. In addition to the examples above, there is a VoiceThread for Education wiki that has lots of ideas for how to use VoiceThread – broken down by grade level! Take some time to explore and get some ideas! If all of this isn’t enough information on VoiceThread, there is a comprehensive guide to using VoiceThread in the classroom. Just be aware that it contains a LOT of information! Because VoiceThread only allows members to leave comments, you are going to have to register for an account in order to participate in this exercise. Their registration process is easy, though. 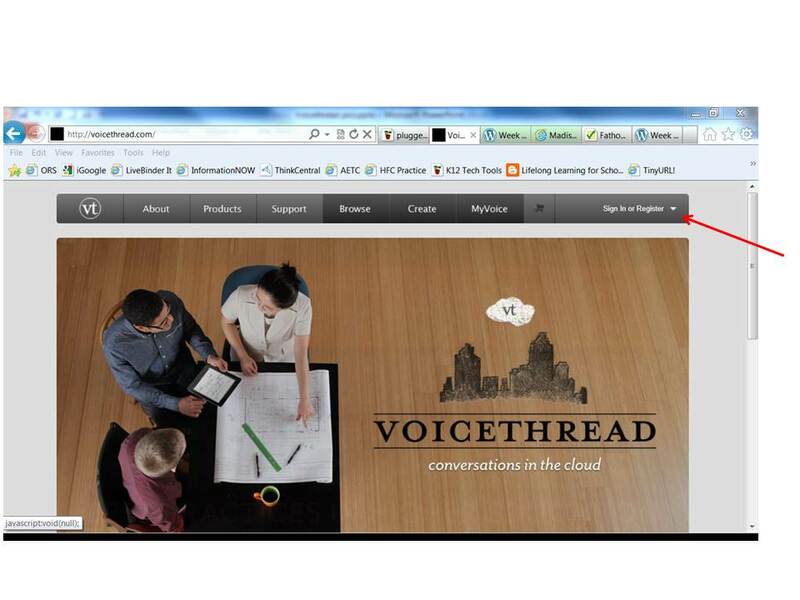 Go to www.voicethread.com and click on the Sign In or Register button in the top, right hand corner of the screen. On the next screen, make sure you select the Register tab. Fill in the required information and then click Register. Now, go to the VoiceThread that I created for this blog. Once there, listen to my thread and then add your own. If you don’t have a microphone, then type your comments! I think VoiceThread is a really cool alternative to the presentation tools that we are used to seeing! It allows students to work collaboratively, while at the same time allowing them the freedom of working individually from home. What do you think? Do you think your students would enjoy using it? What are some ways that you think it can be used in your classroom? Have you ever used VoiceThread before? Share your experiences!